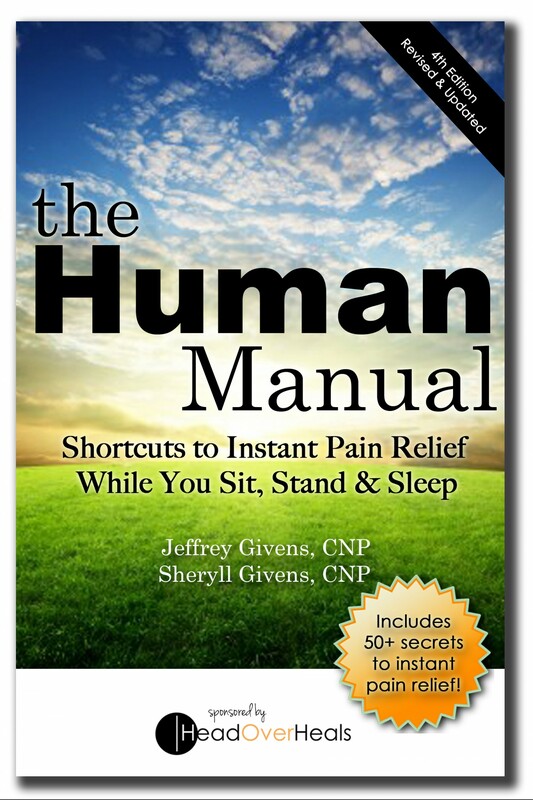 Tips For Instant Pain Relief – Head Over Heals - Sit, Stand and Sleep to Heal Yourself! Find Neutral and Find Back Pain Relief! Neutral Spine Position: A neutral spine is a strong spine and strengthening your spine will help alleviate back pain. It is the natural position of the spine when all 3 curves of the spine — cervical (neck), thoracic (middle) and lumbar (lower) — are present and in good alignment. It is the strongest position for the spine when we are standing or sitting. Basic Position: Lie on your back with your knees bent and your feet flat on the floor. Make sure that your legs are parallel with your heels, toes, knees, and hips all in one line. Let your arms rest at your sides. Relax: Relax your body, including your shoulders, neck, and jaw. Allow your back to rest on the floor, without effort. Your rib cage is dropped with the lower ribs released to the floor as well. Breathe Deeply: Bring your breath all the way into your body, allowing it to move into your back and the sides of your rib cage, and all the way down to the pelvis. Pelvic Tilt: Exhale and use your abs to press your lower spine into the floor in a pelvic tuck. Inhale to release. Then, exhale and pull your lower spine up, away from the floor creating a pelvic tilt. Inhale to release. 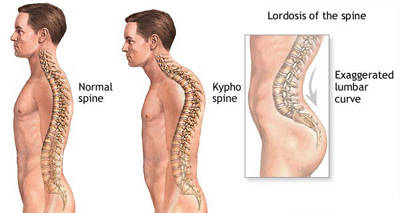 Many people habitually have their spine in one of these two positions, tucked or tilted. To be in neutral spine, you want to be in between these positions, with the lower abs flat and just a slight, natural curve of the lower spine off the floor. Balanced Pelvic Placement: Imagine that there is a cup of water sitting on your lower abdomen, just a couple of inches below your belly button. Allow your abdominal muscles to drop in toward your spine, making your belly flatter. Remember that you don’t want the water to spill, so your pelvis cannot be tipped forward or tucked under. Body Scan: You should now be relaxed with your body in a balanced alignment on the floor. Your breath is deep and full, and your abdominals drop toward the floor. The natural curves of the neck and lumbar (lower) spine, however, are away from the floor. Be sure that your lower spine is not pressed into the floor. That would be a pelvic tilt. The computer age has led to many benefits in productivity for most companies. However, it has led to many people having postural related pain. Protruded head and rolled-forward shoulders are “normal” for many of these computer people. The following are descriptions of exercises that can help minimize or eliminate some pain and discomfort. If you have any pain with these simple exercises stop immediately and consult a physician. These exercises can be performed 2-3 times a day to help alleviate tightness caused by sitting at your desk in front of a computer. If any of these cause any pain, do not perform and see a health care professional. In a good sitting position (with your back straight), pull your shoulder blades back and down. Hold this position for 10 seconds, and perform 10 times. This exercise helps strengthen your shoulder girdle, which helps with putting your head and neck in a healthy position. In the same good sitting position, sit on your left hand and then tilt your head to the right. Make sure your head stays straight, so your right ear is tilting down toward your shoulder. You may or may not feel a stretch (depending on how flexible your neck is). If you do not feel the stretch, gently reach up with your right hand and gently pull down on your head to increase the stretch. Hold this position for 15 seconds and perform five stretches to each side switching your hand positions. Still sitting with your back straight, pull your chin straight back (do not tilt your chin towards your chest). If you are doing this correctly, it will look like you have “a double chin”. For people with neck tightness, they will feel a pulling sensation in back part of their neck. Hold this position for 10 seconds 10 times. 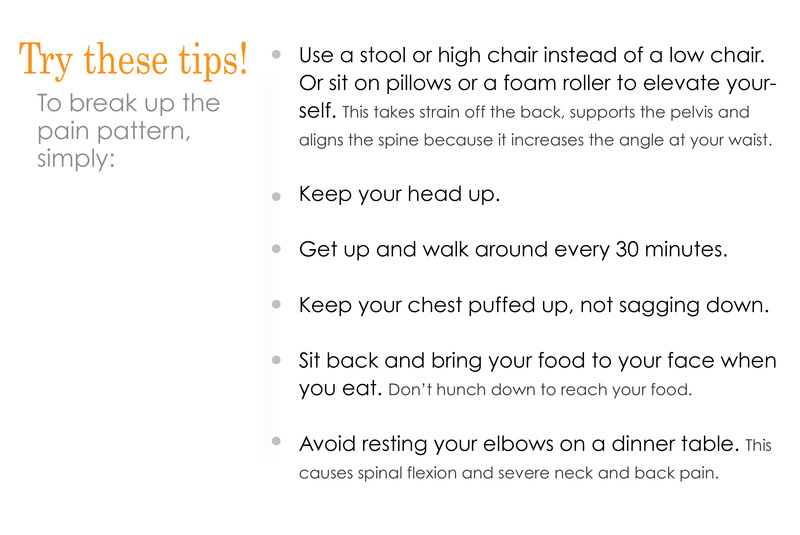 Just be sure to apply any of these exercises and always check your posture. Make it a habit for a healthy you!